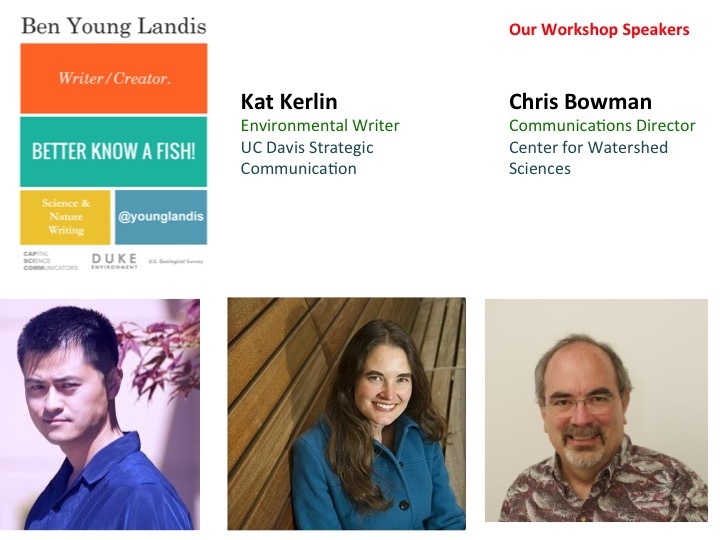 In April 2015, I ran a workshop for graduate students at UC Davis called “Getting your Science out there: Pitching your story and working with your press officer”. The workshop was funded by Professors For The Future and the UC Davis GradPathways program. This comic from PhDcomics.com highlights many scientists’ fears about media coverage of their science: Mainly, that their story will be mis-reported, over-hyped and out of their control. I think that one section that could be added to this comic is a bunch of colleagues pointing at the scientist and whispering something like ‘There’s that guy who over-exaggerated about his research to get on the news”, which I think is one of the scariest things about media coverage for young scientists in particular. In actual fact, understanding a little about what goes into translating your science into a compelling story, knowing the potential audiences for your research story, and taking advantage of the communications resources available at most Universities and large NGOs/ research organizations will make you more confident, better able to control the story about your science, and will lead to better coverage of your research.